OpenDJ is an open source, LDAPv3 compliant directory server. Built on the Java platform, it provides a high performance, highly scalable, available and secure store for the identities managed by enterprises and service providers. OpenDJ is the pillar of ForgeRock I3 Open platform, an open source identity oriented middleware solution powering thousands of the world's largest companies and government organizations. You can find more information about OpenDJ and ForgeRock at www.forgerock.com. First you have to download and install OpenDJ from Forgerock. For a complete documentation on how-to install OpenDJ on your server, please refer to the Installation guide. 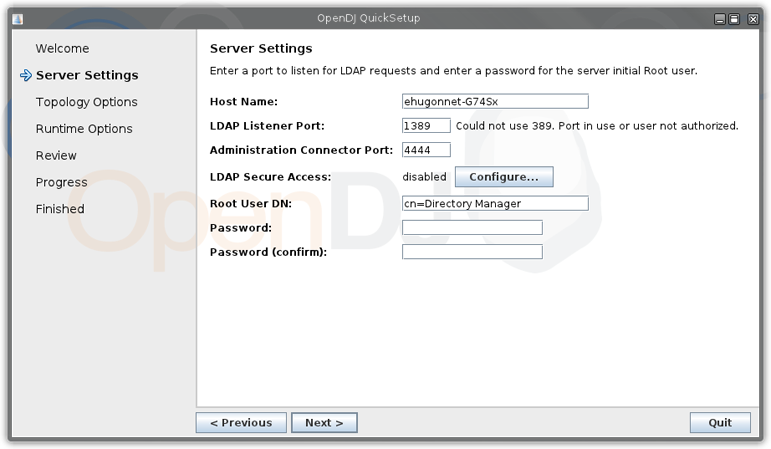 Using the QuickSetup you have a graphical front-end to configure your LDAP server. In a real environment you will probably use a fully qualified name (myldap.company.com) for your server. We leave all the default settings. Let's create some users in the OpenDJ server using OpenDJ's console. If you haven't launch it after the installation process, go to OpenDJ's installation directory. You'll find all the scripts under the bin directroy. To launch the administration console, launch the control-panel script. Now click the Manage Entries menu item on the left. And create a Silverpeas organizationnal unit. Add some users to it so we will synchronize some data. 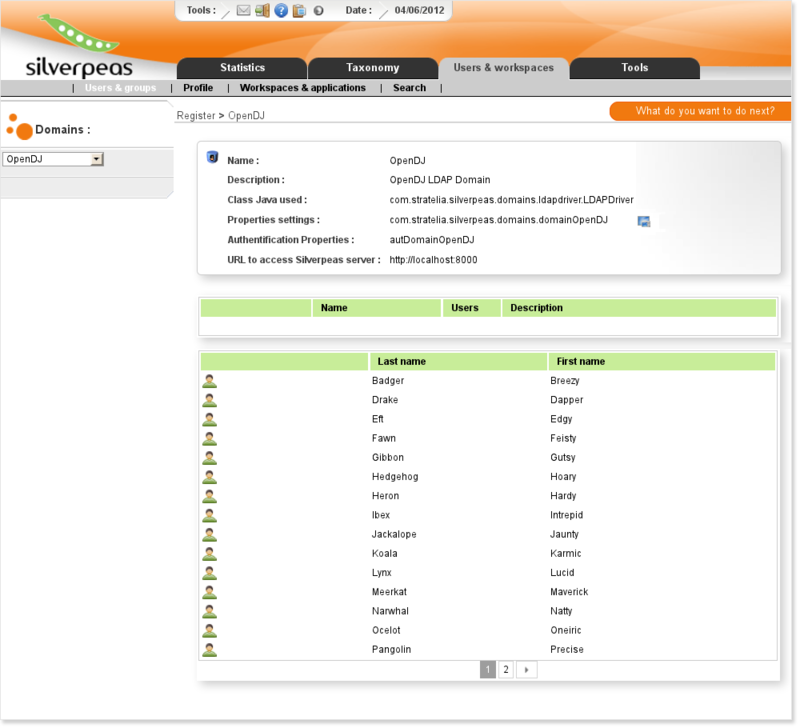 Silverpeas users and groups management is based on Domains. You can create as much domains as you want, each with its own storage type or configuration. Each domain is configured using properties files, let's look at them on the next section. First we need a configuration file to define how to connect to the LDAP server and how to synchronize it with Silverpeas. You would have to create a new domainOpenDJTutorial.properties into $SILVERPEAS_HOME/properties/org/silverpeas/domains. As it happens, you don't have to write this configuration file as it is provided with a default Silverpeas installation. The first section is the configuration of the connection. 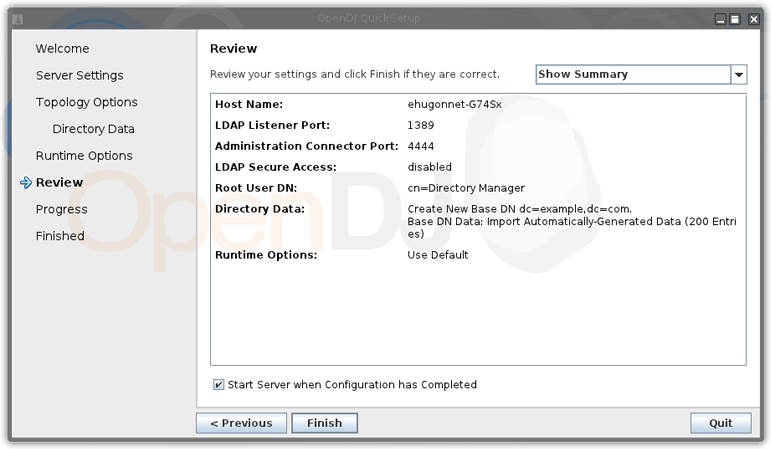 You'll find the port and the address of the server, the user account used to open connections to the LDAP server and the Base DN. # !!! Client Time in MS !!! # !!! Server Time in Seconds !!! The second section configures the synchronization. The parameter synchro.Threaded indicates if the synchronization is manual or if it is automatic, launched regularly. The delay between each synchronization is defined in the file org/silverpeas/admin/admin.properties in the property AdminThreadedSynchroDelay. The parameter synchro.timeStampVar indicates which attribute on the LDAP entries is used to check for modification the LDAP side. Ldap server attribute to check if the entry has been modified in the ldap. Next, we need to configure which users we are going to synchronize, and how their attributes match the mandatory fields of Silverpeas users. 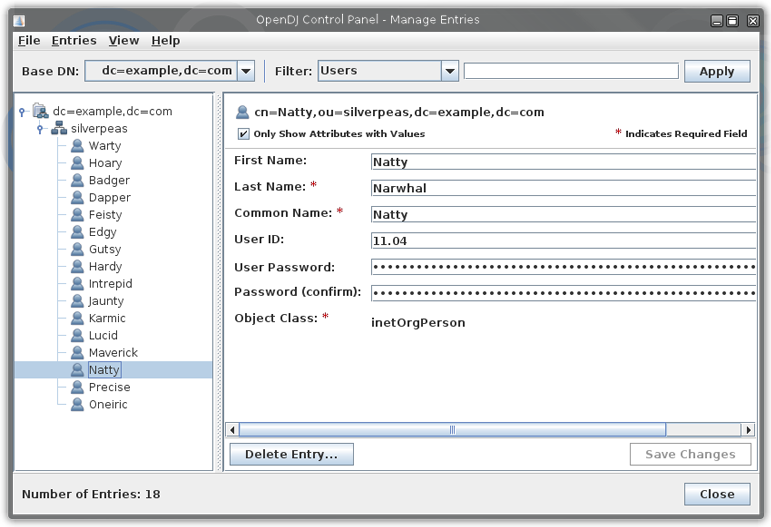 The selection of users is done through a LDAP fiter. Since it is not the purpose of this tutorial to learn such a filter, we will keep the field blank. Silverpeas requires that a user must have a first and a last name, an external id (for synchronization purpose) and a login. # Note : the filter MUST be put between parentheses. Next, are the groups synchronization parameters. It is almost the same as for users. We won't dwell into the parameters for now. Most of the time, the users information are stored in the LDAP directory. So we have to define which are the attributes we are interested in obtaining from it. You can define as many attributes as you want. This attributes won't be stored in Silverpeas database. It will be getting from your directory on-demand. First, you have to define the number of attributes (property.Number) and the resources where Silverpeas will get the multilang labels for the user attributes using property.ResourceFile. property_#.Name: which is the name of the property in the resource bundle. property_#.Type: the type of the property (only STRING and USERID are currently supported). property_#.MapParameter: the name of the attribute in the LDAP entry. Now we need to tell Silverpeas to use this domain for authentication. This is a little redundant and we hope to simplifiy this in the future. This configuration is done with the $SILVERPEAS_HOME/properties/org/silverpeas/authentication/autDomainOpenDJ.properties where you will find the connection parameters for the authentication module. When Silverpeas has started, connect to it and go to the Back Office. 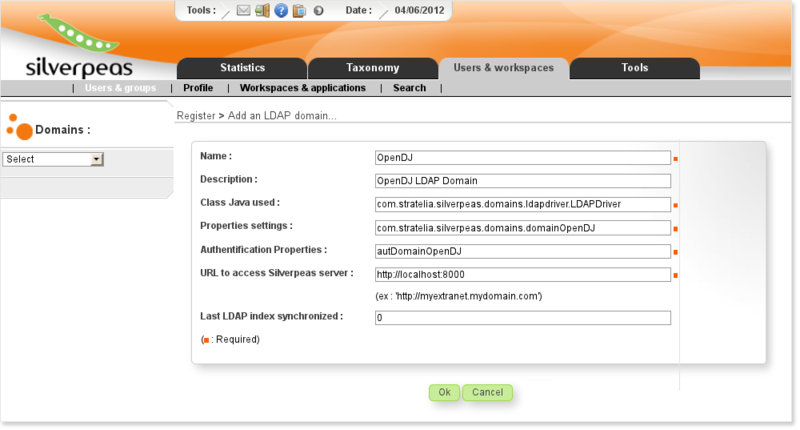 Select Users & groups, and click on the menu item Add an LDAP domain. Now we need to fill the form for creating the domain. While for the Properties Settings field you have to give the whole bundle name, in the Authentication Properties you just have to define the name of the file. The field Last LDAP index synchronized is the timestamp of the latest synchronization. Per default, only users updated since this date will be synchronized. In our example you can set it to 20100400000000Z.